Orr Group also published the detailed version of the report with Other Listed Games expanded, but that full infographic is quite large, so I’ll link to it here. The most important caveat of the data is that it is not a representative sample. As Orr Group acknowledged in the Roll20 Blog post for the Q3 results, the data”only takes into account games and players who filled out relevant fields on their game page/profile.” This is less a report on the industry, and more a report on active Roll20 games and players who responded to a survey. While it does provide a view into the games people are playing, rather than what they’re buying, it’s such a narrow view and you’d need a number of assumptions to make industry-wide generalizations. I’m willing to make those assumptions for the Games data, but not for Players. Respondents are more likely to enter the games at the top of mind, allowing bias towards games with recent news or increased marketing presence. Respondents may be biased towards inputting games they know they can play on Roll20. Knowing that choices are public, respondents may be biased towards games they perceive to be more popular or desirable. Now that players know their choices are being used for this report, they may be trying to manipulate the results. This sounds crazy, but Edition Wars are a real thing. Evidence of this shows with less popular systems like Stars Without Number (fewer players than games) as well more popular indie titles like 13th Age (261 games but only 318 players.) 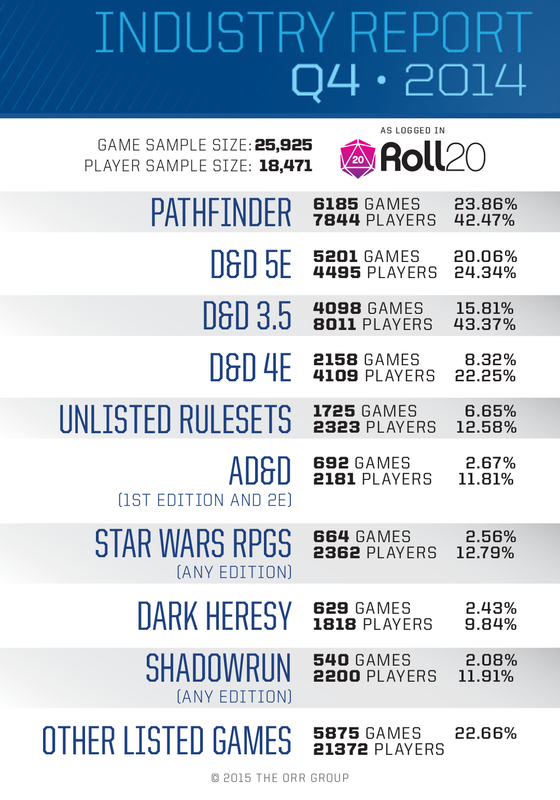 This is even more problematic for non-RPG games; Settlers of Catan, Warhammer 40k, and Munchkin are certainly more popular and played more frequently than their representation in these data, because they are rather niche for Roll20. 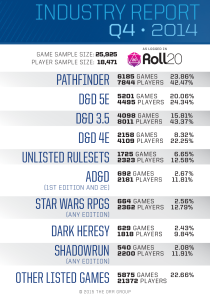 I think the Games data is great for measuring relative popularity of D&D and Pathfinder. They are head-and-shoulders the most popular systems, and they ought to be representative relative to each other. However, I’m confident that Pathfinder, 3.5E, 4E, and 5E don’t total 65%+ of the roleplaying games played, period. The reason for this overstatement lies again in the data source: the optional “Playing” field that only drives Looking For Group functionality. Most importantly, in order to use Roll20’s LFG functionality, you need to populate the field. Herein lies the bias: D&D-PF bloc are the easiest systems to play with pick-up groups, because they’re the most popular point of entry into the hobby, and everyone knows them. This popularity feeds itself. The easier it is to find groups through Roll20’s LFG, the more games will look for players using Roll20’s LFG, and the more games will have the Playing field populated. The trend data, though in its infancy, should be useful for observers like myself in the future. I’m particularly interested in looking at the Game data alongside Marketplace data, and how much Marketplace support (either publisher or third party) correlates with the Game data. I suspect that games with publisher support within the Marketplace will outpace their peers in growth over time. Both the press release and most other coverage of the Q4 report have discussed the increase in popularity of D&D 5E. That’s fine, but I’m not willing to draw conclusions from two quarters of data. I’m hoping they continue to report these data (and expand to Marketplace, for that matter), because a year or two of trend data should take out some of the quarterly noise. This entry was posted in Mundangerous and tagged 3.5E, 4E, 5E, d&d, dnd, Dungeons and Dragons, Orr Group, Orr Group Industry Report, Pathfinder, Roll20. Bookmark the permalink. Thanks for the data analysis. Hoping that more people will come to join the roll20 community.